Around the world, the idea that communities install, own, and enjoy some of the benefits of renewable energy is growing fast. In Germany over 50% of renewable energy being installed is in community ownership. 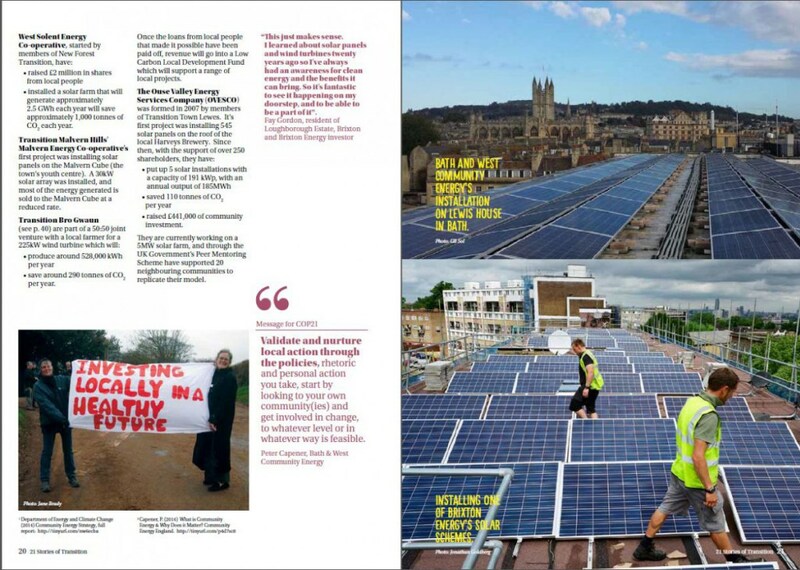 In the UK alone, over 5,000 community groups have set up community energy schemes since 2008. Many of these have been Transition groups, and the schemes they have come up with have varied widely in terms of size. In Japan, the Fujino Electric Company has inspired another 40 communities to start their own energy companies, and in Belgium, many Transition groups are involved with community energy to varying degrees. For example while Champs d’énergie originated mostly from Gelbressée en Transition, Ferréole pre-dates Liège en Transition, but now has many connections to the group. Another of our 21 Stories of Transition included a look at Transition community energy in Luxembourg. This surge in community energy projects is a powerful story. The offer the potential for greater democratic control, for shared benefits and for greater active participation of the community which can, in turn, lead to infrastructure and cultural change. Decarbonising our energy system requires decentralised renewables, which leads us to far greater opportunities for community investment and involvement. And it brings people together, and creates opportunities for conversation, for parties, for relationships. And it’s change people can see happening around them, which means the changes we need to make don’t seem so far off and impossible. raised £100,500 in shares from local people, with 83% of the investors living within a 4 mile radius of the school. have re-distributed £65,000 of profits back into local carbon reduction and fuel poverty projects over the last 2 years. Benefited from 290 hours of volunteer input. 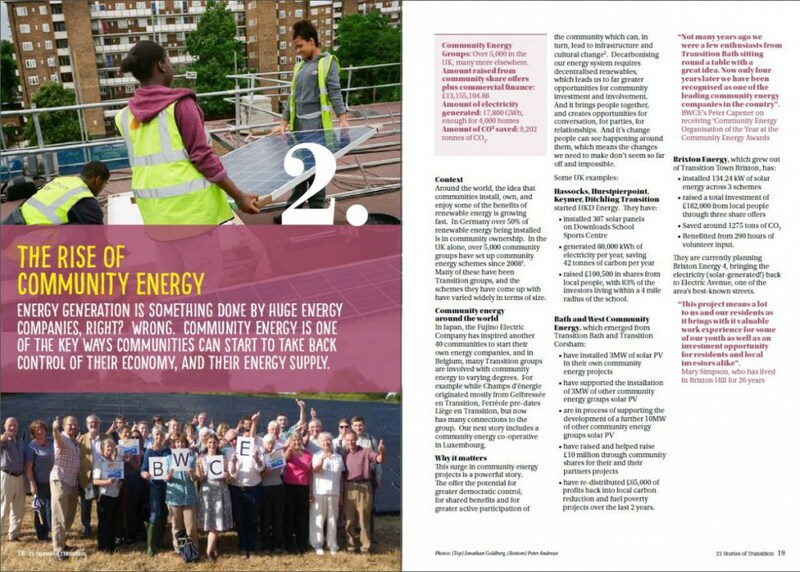 They are currently planning Brixton Energy 4, bringing the electricity (solar-generated!) back to Electric Avenue, one of the area’s best-known streets. "We don’t need governments to show us how to make the changes we need, but we do need governments to work with us to create the conditions within which change can flourish, scale and be embedded at a societal level”. installed a solar farm that will generate approximately 2.5 GWh each year will save approximately 1,000 tonnes of CO2 each year. save around 290 tonnes of CO2 per year. Once the loans from local people that made it possible have been paid off, revenue will go into a Low Carbon Local Development Fund which will support a range of local projects. raised £441,000 of community investment. They are currently working on a 5MW solar farm, and through the UK Government’s Peer Mentoring Scheme have supported 20 neighbouring communities to replicate their model. "Validate and nurture local action through the policies, rhetoric and personal action you take, start by looking to your own community(ies) and get involved in change, to whatever level or in whatever way is feasible". ‘No local’ – Can small scale change the world? Is it the alternative to capitalism?